This year, Novo Nordisk and Inviso are hosting a data driven case competition where students from all fields have the opportunity to solve a real life business case. You will get hands on experience with Tableau and Alteryx and an opportunity to advance your technical skills and your problem-solving mindset. Here you can get an insight into what it is like to be a participant of the case competition. Mads: This summer, I finished a BSc in Business Economics and Administration from CBS and I am now studying a master in IT and Cognition at the University of Copenhagen. Søren: I am studying a civil engineering bachelor degree at DTU named Strategic Analysis and Systems Design. When I participated in the data case competition I was in the middle of my second semester. Why did you join the data driven case competition 2017? Mads: During my time at CBS I participated in a variety of data related projects. My biggest challenges in this regard, was to handle datasets that were too large for Excel. For my thesis I was working with sales data from COOP’s CRM system, and I used the workshops before the case competition to get an understanding of how hundred millions of rows can be processed in Alteryx and visualized in Tableau. The workshops were a great learning experience, since one within a relatively short time could learn to perform advanced analytics of large datasets. For an economist with less programming experience this may have taken longer time. Søren: It was quite random that I ended up participating. I heard about the competition from a friend who heard about it from another friend and so on. That way we ended up joining the competition with a mixed team of students from DTU, CBS and Political Science (KU). I chose to participate to gain general experience with case competitions, but most of all with Tableau, since I had heard how smart and wanted a tool it is. The great thing about the process was the two free Tableau trainings that were offered, so you could really get to know the tool prior to the competition. Did you have experience with Alteryx and Tableau before you attended the case competition? Mads: I had some experience with Tableau before the workshops and was totally new to Alteryx. Even though you don't know the software beforehand, you shouldn't be concerned since the programs are easy and intuitive to learn. It is my perception that a lot of participants from the case competition 2017 got a “wauw effect”, when they realized how fast and easy it is to build dashboards in Tableau without long and cryptical references as in Excel. I believe that getting hands-on experience with software that makes complex tasks smarter and more effective is a unique and important asset for students to possess. This kind of knowledge enables students to deliver key insights on issues that the decision makers in organizations might not even have time to look into. 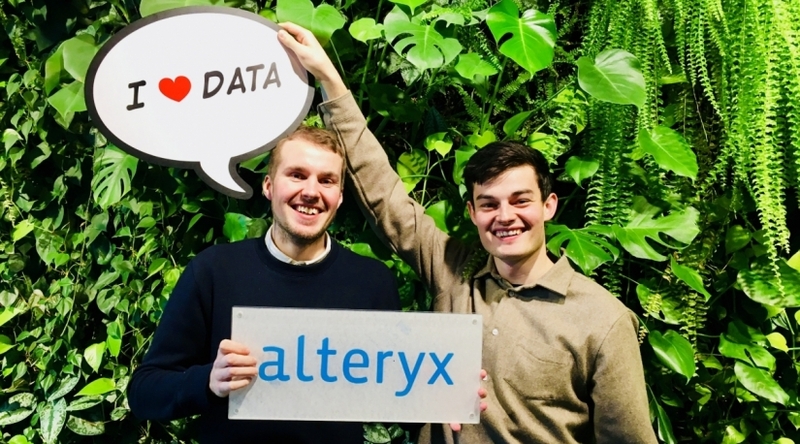 Søren: I didn’t have any experience with neither Alteryx nor Tableau before attending. What was your experience of the case competition last year? Mads: It was a great experience. Besides the workshops giving a great overview of the newest software in the industry, there is a great opportunity to network with other students outside one's own university. The structure of the workshops was convient in the sense of spending a Tuesday and Thursday afternoon learning the programs, and was finishing off with a dinner for all participants. Søren: My experience from last year was really good in a couple of different ways. First and foremost I learned a lot from the workshops, so that I could afterwards use Tableau to make some exciting analysis and visualisations. Also, I learned a lot from working together with students from different educational backgrounds. That was definitely the strength of our group, that we all had different ways of thinking and could contribute with different input. I certainly think the diversity of our team was one of the reasons why we won the competition. What surprised you most and what was the coolest thing about attending? Mads: I was surprised about how easy and fast Alteryx and Tableau made it possible to show something cool and insightful from all kinds of data sources. I also learned how valuable it is to be competent in these programs and how it can be used to distinguish yourself in the job market. Søren: What surprised me the most was how data that I before just saw as a messy pile of numbers in Excel easily and quickly could be made into fancy interactive visualizations that you could dive into to find value and interesting stories. What did you get out of attending the case competition? Mads: An in-depth knowledge of how to utilize the latest software for data analytics. Søren: Last year, the competition was held by Deloitte and Inviso, which gave an interesting view into the work of a consultant. The most rewarding thing for me was some really good contacts, which later on has lead to a new job and many exciting professional challenges. You can read more about the upcoming case competition here. The case competition starts April 18 and ends with a big final event April 21. Sign up for the case competition here.